Chikara is About to Get a Boost of NRG! While much of the Chikara roster has been embroiled in the year long challenge of the Immortals tournament, there has been one tag team that achieved Immortality outside the tournament. The tag team of Hype Rockwell and Race Jaxon debuted in the Chikara ring in late 2014, but have made some big waves picking up 3 points and challenging for the Campeanatos de Parejas over the counter sildenafil on two separate occasions. In September they made good on their second chance and did the impossible unseating the Devastation Corporation to win the titles! 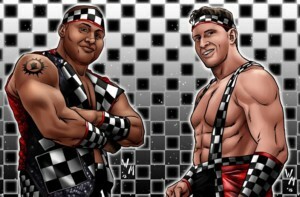 NRG is a throwback tag team, with a striking similarity to a high-energy tag team of the mid-90’s. generic sildenafil citrate Race Jaxon always seems raring to go, and Hype Rockwell seems to have put his sleepiness behind him thanks to the discovery of energy viagra-vs-cialis-best drinks, so there is no telling how successful they will continue to be. They are still relatively is cialis otc new to the Chikara ring, and have accomplished a lot in that time, but still have much to prove to go down as one of the all time great Chikara tag teams. NRG generic cialis 40 mg will be part of the Chikara Immortals game edition coming this December! It’ll be one of our greatest holiday seasons of all time—so save your money for all-time levels of game fun! ← Sam Houston Will Rustle Up Interest in Legends Final Chapter!